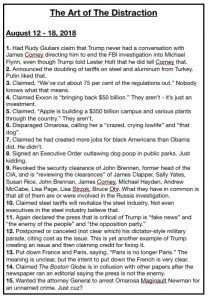 A partial compendium of Trumpian Distractions designed to keep your eye off the ball. CLICK HERE to see how they anticipate distracting you from what they don’t want you to see. Reading time – 2:28; Viewing time – 3:35 . . .
Arthur Jones received over 20,000 votes and won his primary bid to be the Republican candidate for the Illinois 3rd Congressional District. Arthur Jones is a long time, self-avowed and proud Nazi. No Republican stepped up to challenge Jones in this suburban Chicago district. Does that mean that there isn’t a single Republican in the Illinois 3rd with respectable moral values who could have run against and stopped this Nazi? He cites “Jewish cabals” doing reprehensible things in this country, declaring one conspiracy theory after another and, of course, he offers no evidence because there isn’t any. Thanks for that, Missouri Republican Party. That’s a good start. What must be done now is to defeat both Nazis, Jones and West, in November. There’s only way to do that and that’s why individual Republican officials in both Illinois and Missouri are speaking out against these hate mongers and urging Republicans to vote for their Democratic opponents. There hasn’t been even one Republican official in Illinois and no individual Republican in Missouri who has stood up and spoken out against these thugs in the only way that will make a difference. There doesn’t seem to be even a single Republican office holder in these states with a spine. The trumpets should be blaring and urging every Republican to man the battlements against those who are attacking fundamental decency in America. Where is that Republican call? And if it ever shows up, who will answer it? Read what Republican Christine Todd Whitman, former Administrator of the EPA and then Governor of New Jersey has to say about the assault on decency in America and what needs to be done about it. Hers is that trumpet call, telling Republicans to vote for Democrats to defeat spineless Republicans. Because once again Republicans are offering us crickets. When the need is dire, they are nowhere to be found. But we can do something about that in November. What has happened to this once proud and respectable party? And finally, some good news. It’s great to see that, unlike nearly all of our Republican elected officials, our intelligence community leaders are standing up and speaking truth to power. Good on all of you!